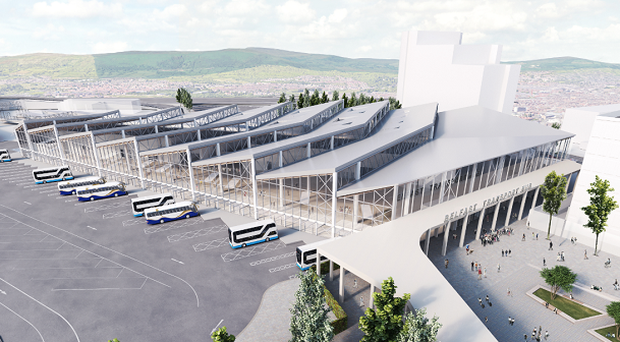 Artist impression of the new Belfast Transport Hub which will be situated on Translink property near the current Europa Buscentre and Great Victoria Street Stations. A new £208m Belfast Transport Hub has been given the planning go ahead by Stormont, it has been revealed. Translink’s new proposed development is set to replace the Europa Bus Centre and Great Victoria Street train station complex. Now, the Department for Infrastructure has issued its notice of opinion for the major scheme, and says it should be given the green light. It is estimated the project could support up to 400 jobs during construction. Detailed plans for scheme show sections of the roof of the main hub are designed to reflect some of Belfast’s manufacturing heritage — inspired by linen looms. The hub will include a public area concourse, 26 bus stands, eight railway platforms along with a new public square. Chris Conway, Translink Group Chief Executive, said: “We welcome today’s announcement, the scheme which will take around 5 years to complete is a further milestone in the transformation of public transport in Northern Ireland. "This modern, innovative Transport Hub will allow us to build on this success, to meet growing customer demand, increase transport connectivity and enhance the customer experience as even more people choose to use public transport. “We look forward to getting this ‘transport led regeneration’ project underway, in order to meet the future needs of commuters, visitors and residents in Northern Ireland. We will continue to work with all our stakeholders as the development progresses." Retail NI Chief Executive Glyn Roberts said: “This is a genuine good news story for our economy. “It will also act as a much needed catalyst for regeneration in that part of the City Centre."